A: The machine accumulates charges PER NIGHT, PER Disc, PLUS TAX. Your credit or debit card is charged when you return the movie. Q: How much is the cost of renting? A: For each day you keep a rental, you'll be charged the daily fee + applicable tax. 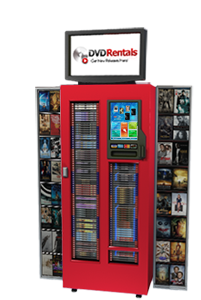 You have the maximum rental period listed at the kiosk to return the movie before you'll be charged the maximum charge, after which the disc is yours to keep. If the disc's ("rental price" + "rental tax") >= ("sale convert price" + "sales tax"), it will be converted to a sale. Q: If I reserve a movie online, how long do I have to pick it up from the kiosk? A: You have up to 17 hours from when it is reserved online to pick it up from the kiosk. Example: If you Reserve a disc online at 3:00 PM on Tuesday, you have until 8:00 PM on Wednesday to pick it up. If you do not pick it up within 17 hours because it has been on hold and unavailable to be rented by others, you will be charged 1 night's rental. Q: My bank shows a charge that is different then the rental charge, Why? charged and the hold is released. On rare occasions your bank may continue to hold it for a day or two. For information about your bank’s policies, please refer to the phone number on the back of your card. Q: The Blu-Ray Disc I rented stops playing while I am watching it. OR it will not play on my Blu-Ray player. But other Blu-Ray discs will. What should I do? A: The studios update the Blu-Ray format from time to time to ensure a better viewing experience. New release movies my not play if the latest version of firmware is not on your Blu-Ray player. Connect your Blu-Ray player to the internet and download the latest software/firmware when this happens to ensure that the movie plays on your system. You can also visit the maker of your Blu-Ray player on the internet to retrieve the latest update for your player. Follow your manufacturers instructions on how to download it, burn it to a cd, and transfer it to your player. Q: What if I select the wrong disc? A: You can view the disc free for up to 10 minutes and return it to the kiosk at no charge if you made a wrong selection. Q: What is the deadline for returns? A: Movies are due back by 7:00 PM the next day or when the host store closes, whichever comes first. Example: If you rent a movie at 9:00 AM on a Tuesday morning, it is not due back until 7:00 PM Wednesday evening. If you can't get it back by then, or you just want to keep it another night, no problem! You will simply be charged an additional night's rental. Please see kiosk for additional night rental charges. Q: If I buy a disc from the Kiosk, what do I get? A: The disc and case that was dispensed from the kiosk. No other additional material. Q: What will happen if I lose the disc? A: If you lose the disc, please contact customer support at support@kornickmultimedia.com. For a lost DVD, the credit card that was used to rent the disc with will be charged the sale price of the disc. Q: What do I do if the disc does not play, is scratched or damaged? A: The most common issue for disc not playing is a dirty disk. Clean the disk with soap and water. If the disk is scratched or damaged, please Contact us ASAP via email at support@kornickmultimedia.com and we will assist you. A: The kiosk does not issue a receipt. However, you do have an option to have one emailed to you during the rental process. Q: How do you guys get the movies before everyone else? A: We are a locally owned and operated small business. We are not bound by the movie distribution contracts of the other rental giants and therefore are able to offer our customers new release movies from Fox, Warner Bros. and Universal up to 56 days earlier. New release movies arrive every Thursday. Q: I have a question that is not addressed here. How can I get help?